Keep relevant, in the know, and up to date. Yes, it does. 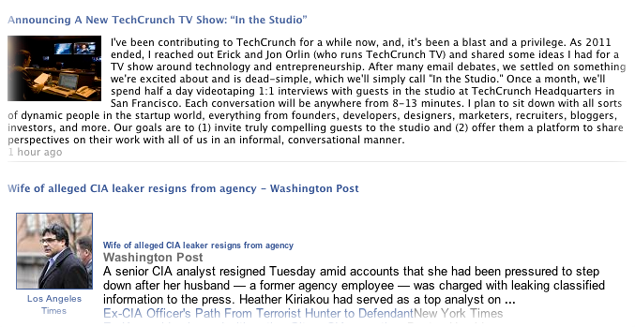 We've taken your facebook news stream and placed it in the toolbar making it accessible with a single click. You'll be able to keep up to date with the latest posts from friends from the past and present - including the friends you keep out of sheer obligation and quasi facebook etiquette. Yes, you can. 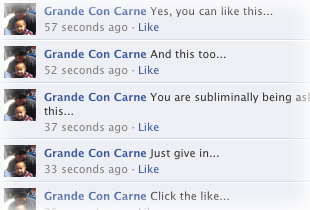 The "Like" functionality of your facebook stream is also available here. You'll be able to "Like" and "Unlike" countless pictures, musings, and thoughts of your facebook friends. You don't have to. See a post that you inspires you to do more than hit the "Like" button? 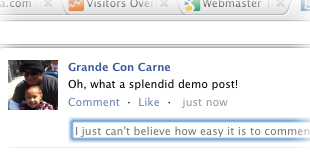 You can comment right in the extension window making the process short and sweet. That is, of course, unless a friend's post spurs you into an uncontrollable heated dissertation on why Giant Armadillo's have more teeth than any other mammal. Tweet. Tweet. Tweet. Yes, it does sound like a bird. We've taken your twitter stream and placed it in the toolbar. You can be updated when any of the twitter users you follow post. Political calls to action, sales pitches from old high school friends with a thin lead barrel, and the thousands of food critics that seem to be popping up as of late. I am sure the sausage handlers at Portillo's will love that last tweet. "Like we didn't see that divorce coming..."
"The president completely denied it... then this dress appeared from nowhere..."
"iPhoneX being released this weekend. First 100 in line will receive it free!" Receive news as its posted. Stay up to date, in the know, and relevant. Sooner or later, you are going to check facebook or check the news during work. Come to terms with it. Embrace the idea. Rather than have it turn into an out of control tangent, use our browser extension to make the event quick, terse, and efficient. 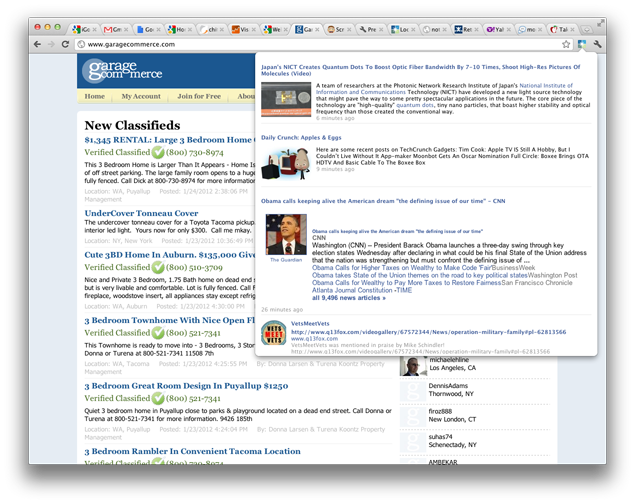 No need for the commitment of an entire browser tab or window. Based on your settings the extension will tell you if there is anything interesting going on. I use the plural reference "us" and "we" lightly. It's really just a single developer behind all of this hooha. I frequently found myself taking very long, winding, unrelated tangents while at work. This normally occurred when I found myself faced with a difficult problem that I didn't have an immediate solution for. This became an issue because my primary responsibility is inherently problem solving. I keep a daily log and review it at the end of the week. A pattern started quickly becoming clear to me. I "reset" when I face a problem that requires effort. This reset manifested itself by catching up on email, facebook, twitter, and news. Generally replaying the first initial motions I take when I first get to work. A normal person most likely would have focused on changing the habit. I, on the other hand, like cake and am generally gluttonous across the board. So rather than remove something enjoyable from my daily routine I set out to make my "reset" routine terse, fast, and efficient. I am happy to report I can facebook, check up on the tweets, and stay current in less than a minute on average. Don't steal from us in any capacity. Otherwise, you can use it as you see fit and at your own risk. Please note, you are responsible for your own actions. I know it seems silly to say that but, if you find a way to do something illegal with this software the responsibility solely rests upon you. We reserve the right to place ads within our software and associated software.